I colored in the image with Copics and fussy cut around to pop him up over the rings. The rings were also colored with Copics and I used my 3/4" round punch to cut them out and an X-acto knife to cut out the center. I strung them across some twine from Queen & Co. and adhered them with a glue dot. The sentiment was stamped and banner cut to pop up. CAS for sure. Happy Wednesday! It's time for another great Hambo Hoedown Challenge! This weeks challenge is to incorporate bubbles into your project. How fun is that? I couldn't resist using a great image from Hambo called Snorkel Boy. For my card, I colored in the image with Copics and cut him out. I then punched out circles in two sized in different colors for the bubble. I popped up all the bubbles and the image for some dimension. I finished off the card by adding Sakura Glaze over the mask and each bubble for a shiny look. Here is a close up. It was hard to capture the glaze right, but hopefully you are able to see it. The sentiment was also popped up and banner styled at the top. Thanks so much for stopping by and be sure to check out the creation from the other Bacon Bits!! Have a great day! Hello everyone! I hope you all had a wonderful weekend with lots of warmth and good weather!! It's time for another Timeless Tuesday Challenge and I am your hostess this week. With summer vacation here for some or around the corner for others, the thought of lazy days, porch swings, lemonade, and children playing is not far from our minds. My challenge is to make a card or project that reminds you of summer and incorporate the breezy feel of sheer ribbon. For my card, I couldn't resist using Kids Play because it reminds me of my children during this time of year; In constant play! I "rock and rolled" the image with Memento Desert Sand and Rich Cocoa for a dual color look. But then I felt there needed to be some green in it. I took my water color pencil and shaded a bit within the hills while blending it with my water pen. I stamped the sentiment with Memento Bamboo Leaves while the paper is MME The Sweetest Thing. I finished it off with my sheer ribbon and flower and some rhinestone flourish from Prima. I used this weeks Unscripted Sketch for my layout. Don't forget to check out the other fabulous creations from the Timeless Tuesday Team! While I am getting crafty today, I don't have a project at this moment to share, but I do have 2 new giveaways! I did some more house cleaning last night and came across many MFT stamp sets that have either retired or I just don't use any longer. 22 sets total. Some are still new while others are either used or gently used. There is 1 The Cat's Pajama set in there along with some AC Papers and some scallop panel papers. There are too many sets to name but each winner will get a random selection of stamps from this stash. One person will get the scallop panels while both will receive the AC papers in a 6x6 stack. The cases are included. Again, all you have to do is be the first 2 to comment and half this stash is yours! That's it! Good Luck and thanks for stopping by! Hope you have a fabulous Memorial Day!! Happy Memorial Weekend everyone! I hope you all are enjoying this wonderful weekend but not forgetting why we have it. I live it everyday and more so as my husband is deployed. I know I will always remember and will always thank those who have served, are serving, or have made the ultimate sacrifice so that we can continue to live in freedom. I have been spending this day doing some cleaning of my craft room and have found several items that need a new home!! It consists of several OCL sets, American Art Stamps, Your Next Stamp, and two MFT stamps along with some paper from Cosmo Cricket Boyfriend collection with coordinating chipboard, Basic Grey Cupcake, MS, Jeni Bolin, Autumn Leaves Mat packs, a pack of Maya Road fabric flowers, and Humorous ATC packs!! The chip board will be taken apart to make for easier shipping and two of them are missing. The paper packs are fairly full with a just a few used by me. So how do you win? BE THE FIRST PERSON TO COMMENT AND THIS STASH IS YOURS!!! That's it! No waiting, no random drawing! Welcome to "The Battle of the Bands" sponsored by Hambo Stamps! Today Hambo friends and the Bacon Bits Design Team are bringing you fun creations that depict Band groups! It might be our favorite, or just one that was fun to design. If you arrived here from Kecia's blog, you are in the right place! If not, you might want to start back at the beginning at the Hambo blog to make sure you are eligible for the hopper prize! A prize will be awarded to one participant whose Battle of the Bands' themed creation tickles the Bacon Bits’ fancy in a hammin’ jammin’ way! Another prize will be awarded randomly to a hopper who comments on all of the blogs along the way. The winners will be announced on the Hambo company blog, Talk to the Ham, on Wednesday, May 29, as well as at the Hambo Hoedown challenge blog. We love comments anytime, but the deadline for prize entry comments is Sunday, May 26 at 5 PM CST. Don't miss it! My creation is one I just knew I would use the moment I heard about this hop! :) It was one of my favorite bands in the 80's (Yes, I am dating myself...) and I still enjoy listening to their music. Can you guess which band I am talking about? Yep! THE CURE!! Here is a video of one of their popular songs and one I am sure you all have heard before. 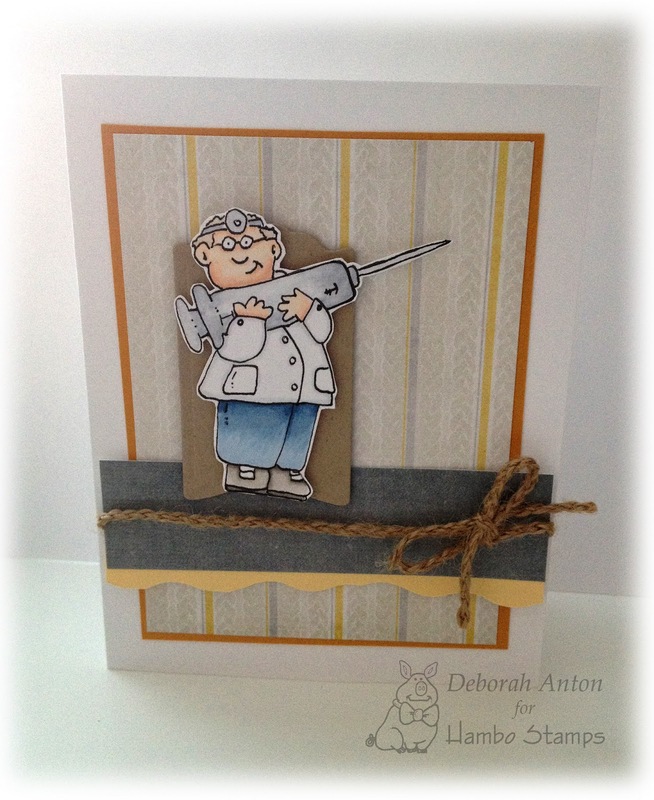 For my card, I used the Hambo Digi image of Dr. Needle which is colored in with Copics. I cut him out to be popped up on Flourishes Bookplate die. I used Pink Paislee dp of Indigo Blue which you can find at the Hambo store. I added some burlap ribbon for a more rustic feel and left the card with no sentiment to be added later. Now jam on over to Deanne's blog for another great Band group that will have you tappin' you foot! Here is the list of all the blog hoppers for you start at the beginning if you haven't done so already, so that you will be eligible for the hopper prize! Deborah http://beadnstampn.blogspot.com -------------------> YOU ARE HERE! Thanks for jamming with me!! Life is good! Especially now that summer vacation has officially started! Yesterday was the last day of school and we were very ready for it. Yesterday was also a new challenge week over at Hambo Hoedown challenge blog. This weeks challenge is to create your own sentiment to your image. LOVE that! I can always find something new to say with some stamps when I look at them. It makes creating fun! I stamped the image with Black Memento ink and colored it in with Copics. I used some washi tape for the bottom strip and top flag and some dp from MME for the other. I finished it off with some ribbon and mini flowers with some rhinestones throughout. Don't forget!! On Friday, May 24, we will be having a customer inclusive blog hop (Sign-ups are closed). Our theme is "THE BATTLE OF THE BANDS" where we will be showcasing Hambo clear, rubber and digi images. Be sure to join us and hop for prizes beginning at 7 AM CST at Talk to the Ham! Be sure to stop by the Hoedown Challenge to see what the other Bacon Bits have created! Thanks for popping in here! Are you ready for another Timeless Tuesday challenge? 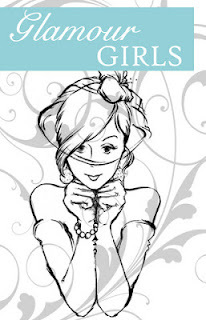 This week, one of our new girls, Jenny is your hostess and her challenge is to use Butterflies. I will be honest to say that I do not use butterflies as often as I thought I did but luckily, I had a few things I was able to use. One being the new release set of Old Tea Rose which has a beautiful butterfly stamp in this set. For this card, I used Kraft cs as my base layering it with some striped dp from the Paper Studio and some Washi tape from Recollections. I then stamped the butterfly from Old Tea Rose twice on the base and colored it in with some watercolor pencils and accented it with my Copics. I then stamped a third butterfly on some watercolor paper and colored that in with my pencils before cutting it out. I stamped the sentiment and cut that out using the Perfectly Pierced Classic Window die set and sponging lightly inside with my distress inks. I popped up the third butterfly and sentiment, and finished off the card with some sheer ribbon, mini roses, and cotton lace trim. The mini pearls are of different colors and placed in various spots. Be sure to stop by the other Timeless Tuesday Team blogs and leave a little love! Thanks for popping in! Deborah Anton --------> You are here! 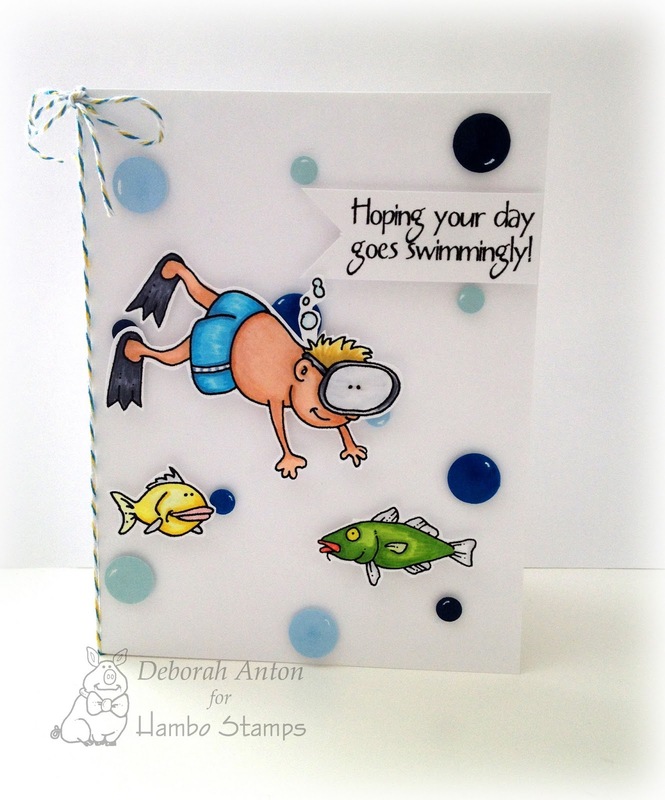 With that mentality, I have made a quick and easy card using SRM Stickers Express yourself - Water Fun. I used paper from AC - Margarita and fussy cut around the waves. I added a lifesaver from TCP's Aye Aye Captain set and popped it up with some twine to hang from a wave. The sun is MFT's Die-namic sun die and finished with the sentiment sticker from SRM. I hope you all have a great Monday and thanks for popping in! Time for another Hambo Hoedown folks and this weeks challenge is to use your punches! Remember those? :) With so many dies on the market, a few of our punches have collected some dust. So, dust them off and play along! 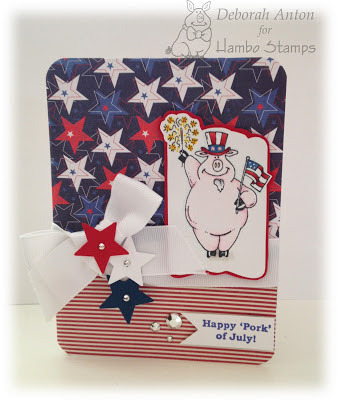 I am ready for summer and the 4th of July at the beach, so I used a super fun stamp called Uncle Ham and the coordinating sentiment. Don't forget about our customer inclusive blog hop on May 24!! Today is the LAST day to sign up to join along in the fun. And it will be fun! Our theme is "THE BATTLE OF THE BANDS" where we will be showcasing Hambo clear, rubber and digi images. Using any Hambo image, create a project that represents and depicts the name of a (professional) band! Maybe it’s your favorite group, or maybe it’s one that you don’t even like! Whatever it is, we want to see your BAND NAME creations! You do not need to have the Band name on your card or project, but please put it in your post. TO SIGN UP, please send an email to hambodesignteam@gmail.com with "BLOG HOP" in the title BY MAY 15. Once we receive that, you will receive all the low-down on how to participate! Please do not sign up if you can't follow through with it. It takes a lot of time to organize a hop, and those that hop with us don't want any broken links! We had a lot of fun with our last customer hop, and hope you will join us! Oh -- and did I mention prizes? 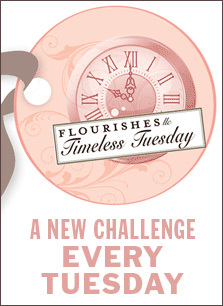 It's another Timeless Tuesday Challenge and Broni is your hostess. Before we get on with the challenge, we are excited to welcome three new faces to the Timeless Tuesday Team and sadly having to say good bye to Cindy. Her projects and fabulous talents will be missed and we wish her all the best with her new endeavors. You can see the new team members here. 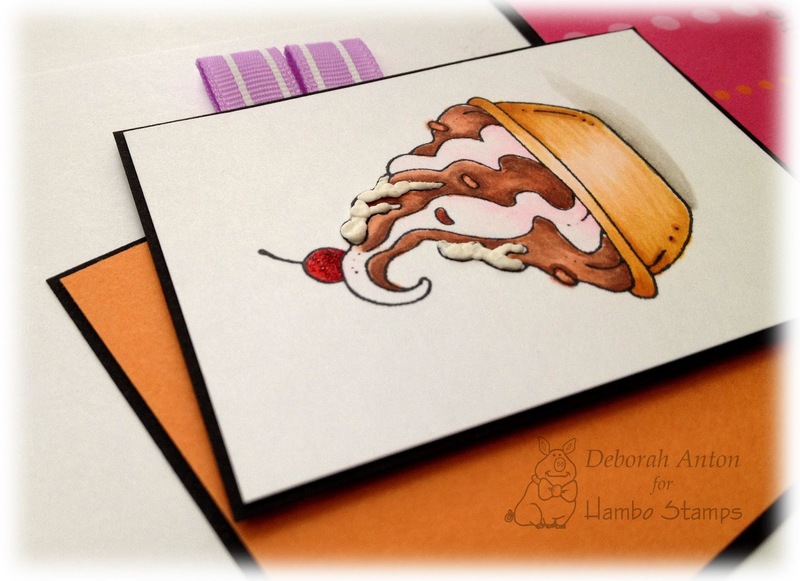 For my card, I used the new release set of Simply Charming which I stamped on Flourishes classic ivory cardstock and colored in with this set of Copics keeping a clean look to the card. I used some dp from K&CO that I've had in my stash along with some crochet ribbon and flower from Recollections. I completed the look with some muted green pearls from Kaisercraft and twine from May Arts. Be sure to check out the other fabulous creations the Timeless Tuesday Team have put together and leave them some love! Thanks for stopping by! I used my 3/4" circle punch to punch out the circles and then placed them at a diagonal on the layer. For the base, I used the darker hues and cut thin strips to add to the bg. I finished it by using a sentiment from SRM's Express Yourself - Waterfun collection and a piece of Sticker Stitches. Super simple and easy. There are many different ways you can use paint chips to add a little fun color variations to your cards. Ready to get sketchy? It's Wednesday, so that means another Hambo Hoedown challenge. 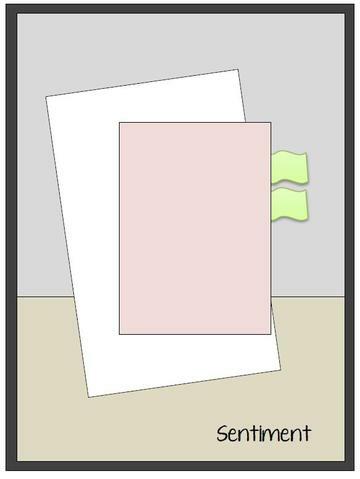 This week, it's a sketch and perfect for any image. On Friday, May 24, we will be having a customer inclusive blog hop. Our theme is "THE BATTLE OF THE BANDS" where we will be showcasing Hambo clear, rubber and digi images. Using any Hambo image, create a project that represents and depicts the name of a (professional) band! Maybe it’s your favorite group, or maybe it’s one that you don’t even like! Whatever it is, we want to see your BAND NAME creations! You do not need to have the Band name on your card or project, but please put it in your post. This will be super fun so we hope you will join us! Thanks for stopping by today! Hello Flourishes Fans! We have a special treat for you today because we are kicking off the festivities for Day 1 of our Flourishes‘ Sneak Peeks for May and we have teamed up with the Flourishes Finest Design Team to play along with the Timeless Tuesday Challenge this week. Want a little peek at the set we’ll be showcasing today? Our Glamour Girls stamp collection, illustrated by Lauren Pope, is a fabulous collection of lovely ladies and some classic "girl talk" sentiments perfect for all those charming gals in your life. 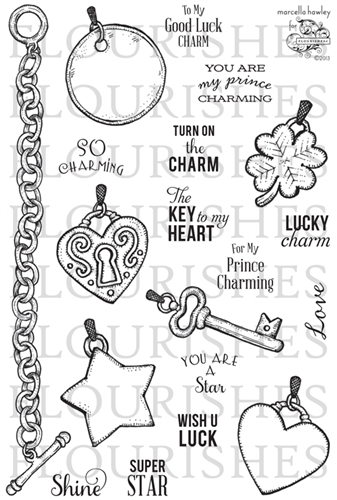 This classy stamp set arrives just in time for Mother's Day! What more can you ask for? Now on to our challenge… Denise Marzec is our Timeless Tuesday Challenge hostess this week and for her challenge this week, we want to see you use some "BLACK ACCENTS" (FTTC219) on your card or project. Let's see you use some black matting, black die-cut images, black ribbon, or try the ever popular "chalkboard" technique that's popping up all over the blogging world. Today we have both our Flourishes Finest Design Team AND our Friends of Flourishes Team sharing their "Black Accents" inspirations with you! Take a moment and leave some love on all of our designers' blogs. Come and hop along and visit with all of our super talented Flourishes designers and join us in our challenge this week for a chance at winning our ENTIRE new May release!! Yup... that's right... you could win our entire new release just by playing along. Check out the Flourishes Blog (http://flourishes.org/2013/05/timeless-tuesday-black-accents/ ‎) for further challenge details. Good luck everyone! 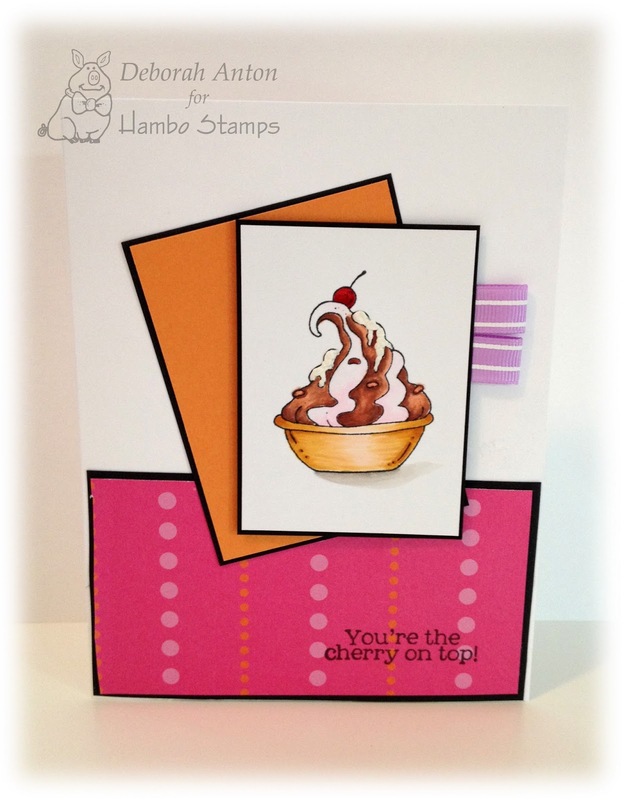 Allow me to now share with you my card created with this ever-so-glamorous set! Isn't this image just beautiful? I stamped her with VersaFine Black ink and heat set it before coloring her in with Copics. Once colored in, I cut out the image using Flourishes Perfectly Pierced Classic Window die set and sponged the inside with Antique Linen Distress Ink. I used MME's In Bloom collection for the dp and followed last weeks Mojo Monday's sketch. I finished the card by using some yummy Wrinkle Edge sheer ribbon from The Stamp Simply Ribbon Store and adding a pearl stick pin and two pearls on either side of the sentiment. Here is a closer look of the image and hopefully of some of the sparkle from the Spica pen used on the plume and sentiment. So, now go blog along to see all the other designers glamorous creations and have a chance to win the entire May release!!! Thanks for stopping by and hope you have a glam day! Happy Teacher Appreciation Week for all you educators out there! Teachers have such a tough, yet rewarding job, that I personally don't overlook that to ensure they are appreciated! I had many teachers to thank and only so much time to get some cards done. The best quick way is using SRM Stickers to do it! It makes for quick and easy cards to knock out and get your point across. For these cards, I used Say it with Stickers - Teachers. This set is wonderful, complete with wonderful quotes and sayings. All the cards are CAS because I really wanted the quote to be the focal point of it. I also incorporated some Twinery Twine which you can find at SRM, as well as Sticker Stiches. Another fabulous way to spruce up a card without actually "stitching!" If you are an educator, I wish you a wonderful day, appreciated by your students and the parents. You have my support here! Thanks for stopping by and have a great day!